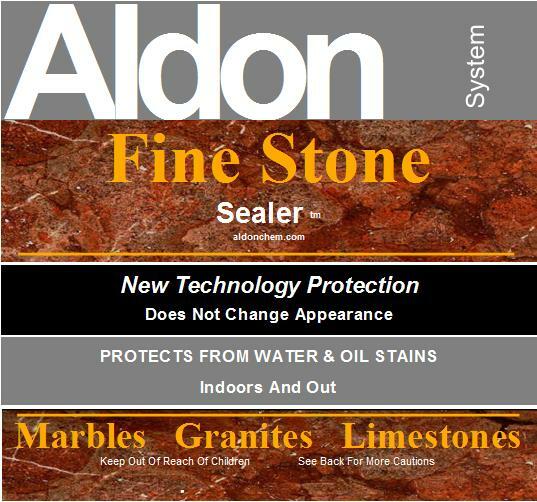 "Fine Stone Sealer" by Aldon. To seal polished finish marbles & limestones. "Fine Stone Sealer" protects from staining the factory finish of polished and honed marble and limestone. A honed finish is not reflective to a high degree like a polished finish. A honed finish looks and feels "softer". "Fine Stone Sealer" is a special water based formula that is an easy to apply and invisible finish for those polished surfaces of marble, granite, and limestone requiring no change to gloss or look. The "fine stone" (honed, polished) finishes are created by machine grinding with finer and finer grits and grinding compounds. Some of these finishes are difficult to apply a sealer without leaving brush marks. "Fine Stone Sealer" does not have that problem and is used by homeowners and contractors. See further items of discussion and pictures of how it works lower down. You can protect that expensive polished marble or limestone!
. "Fine Stone Sealer" will save these expensive stones from staining and prevent the need for restoration! However, if you already have etch marks or stains, please review Fine Stone Restoration. It can be restored.
. Although this formula sealer is expensive by the pint, the coverage on these low absorption type finishes is so great that the cost per square foot is quite low. Therefore, this particular formula technology is expensive, but the actual cost on a project is not. You know that the ability of a stone to take or resist a stain varies tremendously and is not always observable or predictable. Even when two pieces come from the same slab originally, one can have microscopic fissures, pores, color characteristics, etc. that is different from its adjacent piece. See the "Surface Types" section to identify and classify your stone, then review the discussion of these issues on your stone's page.
. Used by DIY and professional installers. Other companies sealers have streaked on application to your surfacing and you want a sealer that will not do that. You do not want any visible change to the existing finish, but do want to protect it from staining. Even if water drops bead up, some of these stones (granite, marble, limestone) have micro-fissures that can allow small molecule liquids (phenol cough syrups, solvent based liquids, etc.) below the surface. See our "Problem Solving" page for this issue. You have an already low traction surface and you want to retain that condition and not create any gloss. Do you have etch marks or unremovable stains in marble or limestone? Review "Fine Stone Restoration" to remove them and restore the surface before sealing. Decide later you want a little gloss? You do not need another sealer. Just apply "Lifeguard". Is your stone sealed with a non-Aldon sealer that is failing? The sealer that is still there might not allow "Fine Stone Sealer" to contact and bond to the stone. In that case, test Aldon "Premium Stripper" first. Once the sealer is out of the way, the finish can be restored, then sealed for long term protection with the appropriate Aldon Sealer. How does "Fine Stone Sealer" work? The term "fine stone" is not in reference to the stones themselves, but to a certain type of factory finish grind of marble, granite, and limestone. The "fine stone" finishes are very smooth finishes called "honed" and "polished". "Honed" typically looks and feels "soft" and has low reflectivity. "Fine Stone Sealer" is used to protect this kind of finish. "Polished" typically looks and feels "mirror like" and is highly reflective. "Fine Stone Sealer" is used to protect this kind of finish. To add to the inevitable confusion, there are varying degrees of finish where the more highly polished "honed" finishes approach a "polished" finish. And, you might not even have limestone or marble. See this page for testing to determine what you really have. Two pieces of Polished Marble. This stone finish is almost non-absorbent without sealing, but will stain. "Fine Stone Sealer" was applied only to the right half of each. Top picture is water drops. Bottom picture is oil drops. Red arrows point to drops on the unsealed half. Yellow arrows point to drops on the sealed half. One piece of White Turkish Limestone. This stone is absorbent without sealing and will stain easily. 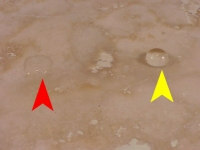 This shows that "Fine Stone Sealer" works as well on very absorbent surfaces also. "Fine Stone Sealer" was applied to the corner sections and not in the center. No change to color | No gloss | No appearance difference observable from the sealer. 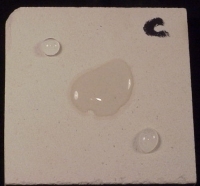 Top picture is water drops, bottom picture is drops of highly penetrating oil based black colorant. Note high beading due to sealer repelling liquids. Note both liquids spreading and soaking into the unsealed center. Note colorant is staining unsealed center in bottom picture.